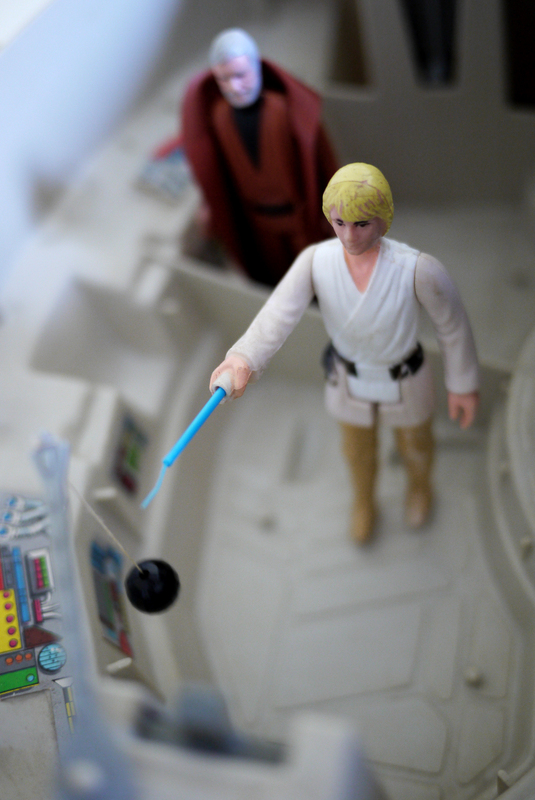 As I mentioned in the Star Wars activities post a couple days ago I was working on a toy photo. I wanted to do something to tie into the new Solo movie so the plan was originally to make a video of Kenner's Han Solo action figures and the Millennium Falcon similar to the first Star Wars video I put together for Tatooine. However, my Falcon isn't in the best condition, the sound effect isn't working, and I'm missing a couple pieces. 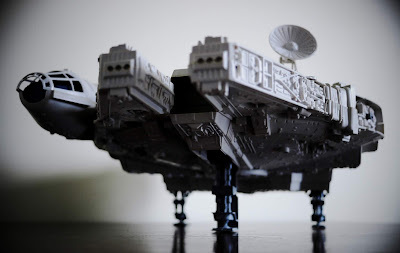 Then I thought maybe I can make a cool photo recreating the Empire Strikes Back scene of the Falcon parked inside of the Exogorth (the space slug on the asteroid). I did attempt that but struggled to get a good image so next I thought about just making a space scene and that photo came out rather well I think. I'm posting them both and a little about how I made them. Before I get to those though, first I'll start with a quick look at the toys. 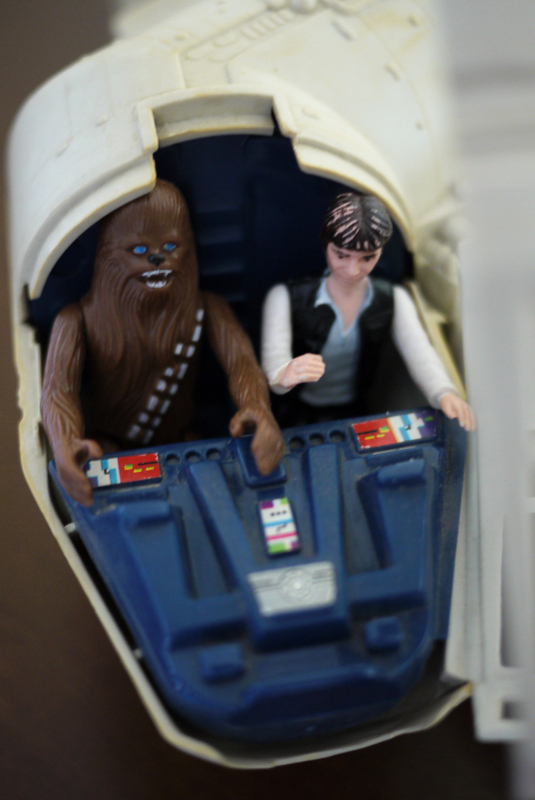 Kenner released a number of Han Solo figures beginning with the first movie. There are two versions from the first movie, often referred to as the original, or small head, and the big head one which is what I've got. For Empire Strikes Back (ESB) Han received two action figures: one in the Hoth outfit and one in the Bespin outfit (with a different gun than he carried in the movies). 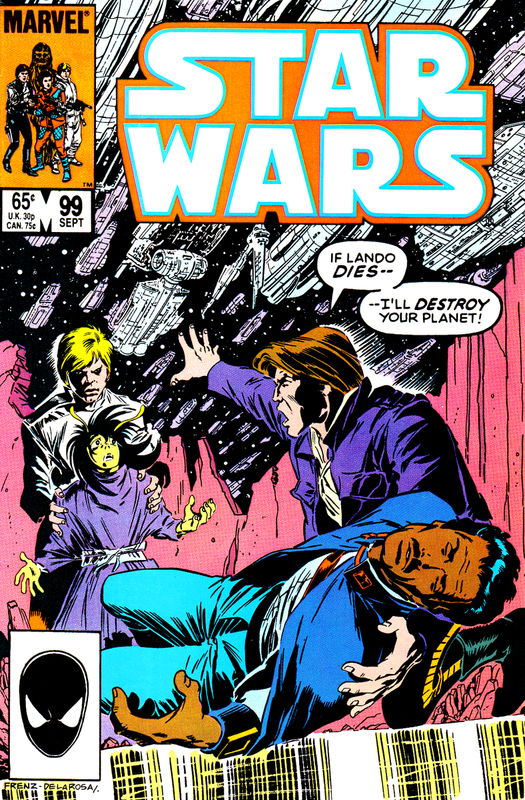 Of course, he got a Return of the Jedi (RotJ) figure as well, for that release he wears a trench coat. Around the time Kenner released The Power of the Force (1984-85) line of figures I stopped acquiring Star Wars toys. That final Star Wars toy line includes a Han in carbonite figure. 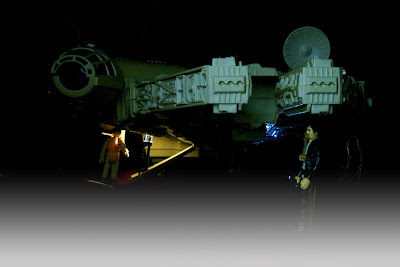 In the photo below I put the figures in appearance by movie rather than release date and although I do not own the carbonite figure, I have substituted in the Han in carbonite accessory that was packaged with Boba Fett's Slave I ship. Also pictured is the 1995 Han in Stormtrooper disguise which was a mail-away promotion from Hasbro and Kellogg's Fruit Loops cereal. 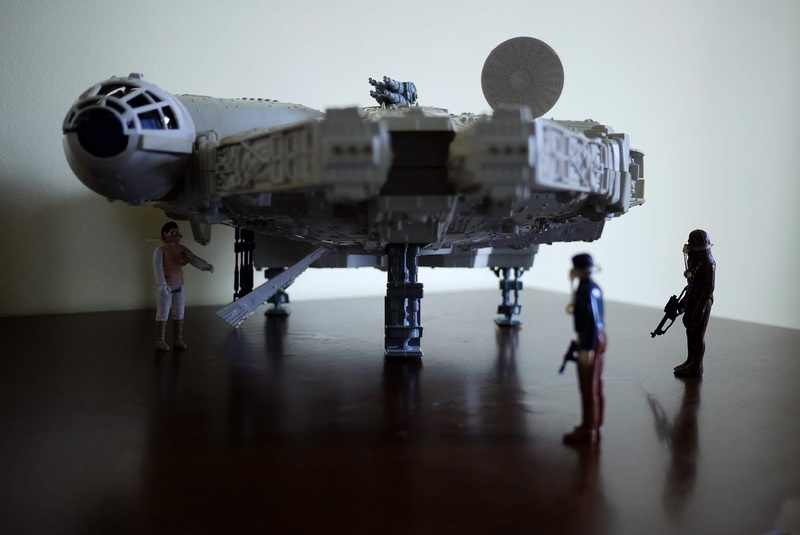 Since this post is meant to tie into the Solo movie I've added Chewbacca and two of three Lando Calrissian figures. 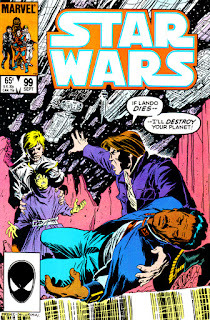 Lando's third figure (RotJ general outfit) was part of the aforementioned Power of the Force release which I'm lacking. the figures being displayed in this photo. 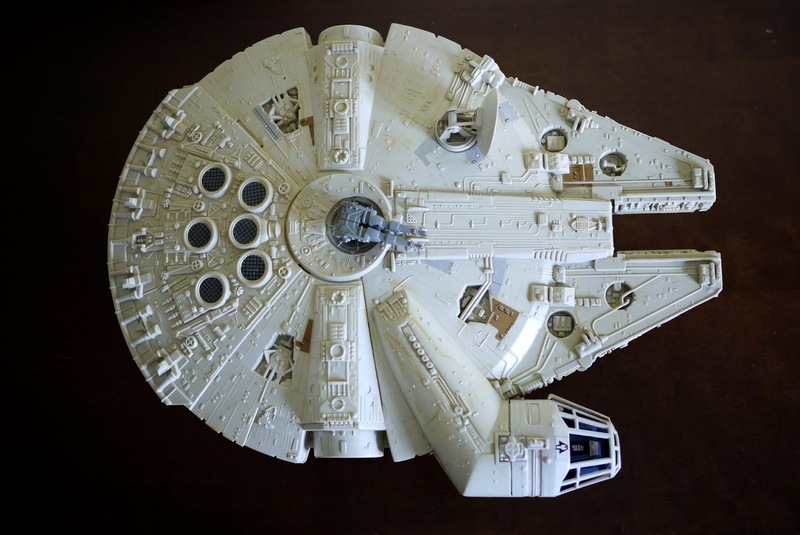 Han Solo's Millennium Falcon is arguably the most iconic ship from the Star Wars films and Kenner's toy is a great recreation, though it isn't too roomy inside which is understandable. 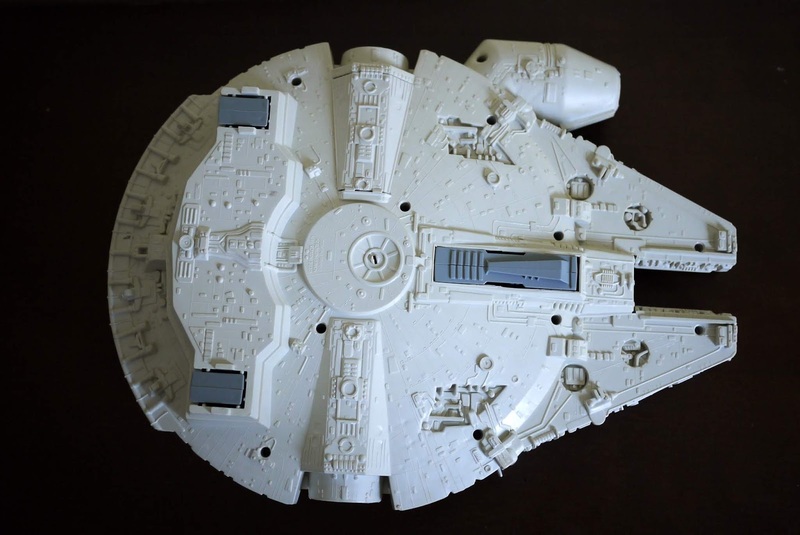 The top of my Falcon is discolored which looks bad but at the same time is kind of realistic as the ship is often on the rustic side in the movies. 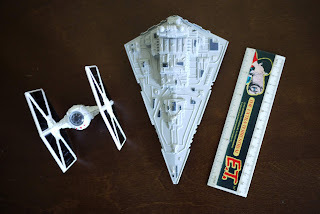 Rebelscum.com has some immaculate photos of the toy; it's so clean that it looks both impressive and a little strange to me. 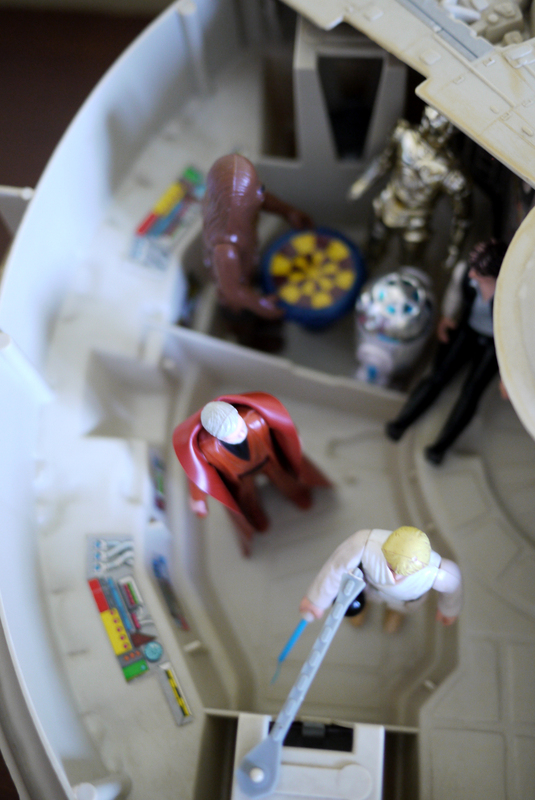 In the photos below you'll see Luke has his head as I decided to glue it back on; I discussed that previously in the Tatooine video I linked to above. Also, since I cannot locate Luke's lightsaber I gave him Obi-Wan's. 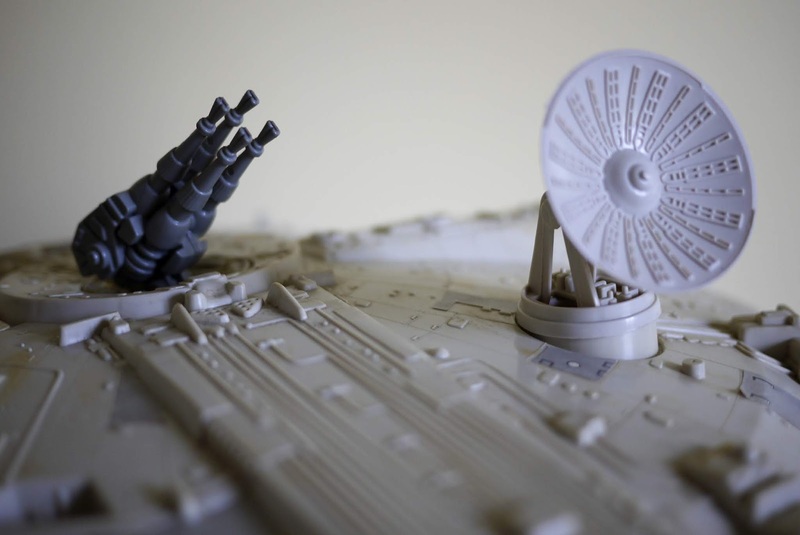 The Millennium Falcon with landing gear down. The top of my Falcon with fading and yellow lines. The bottom is actually still quite clean. 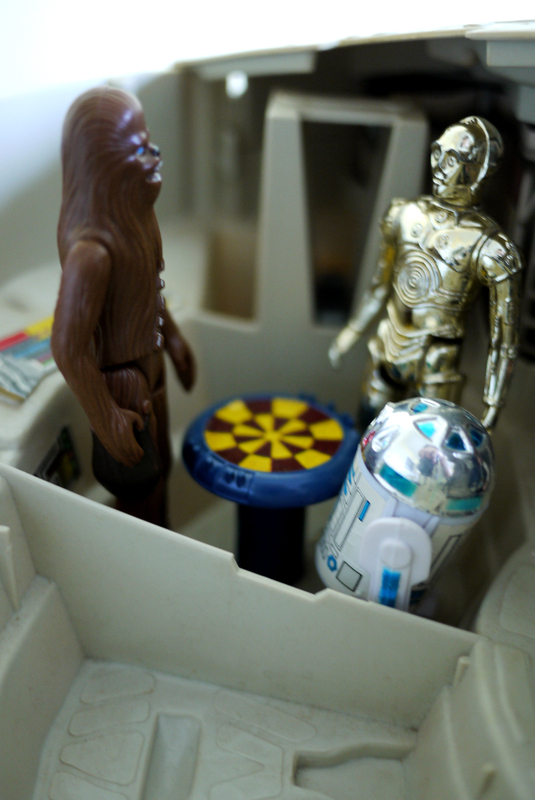 Chewie & R2 playing Dejarik. 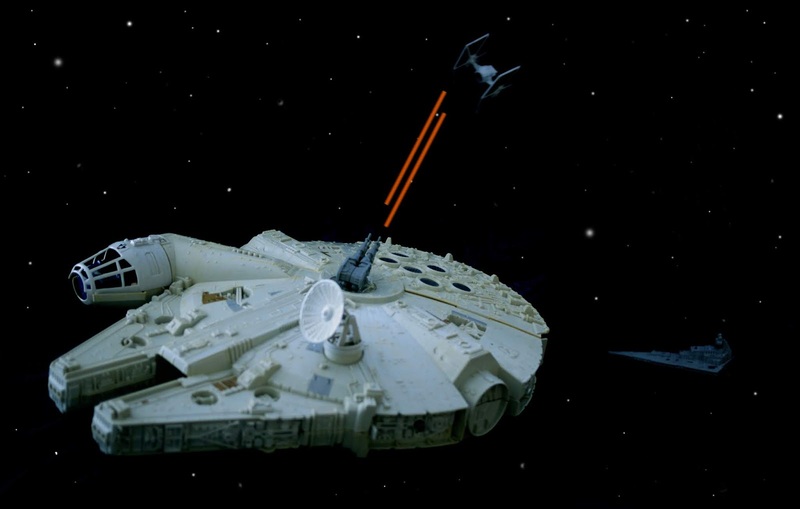 Quad laser cannon and sensor dish. 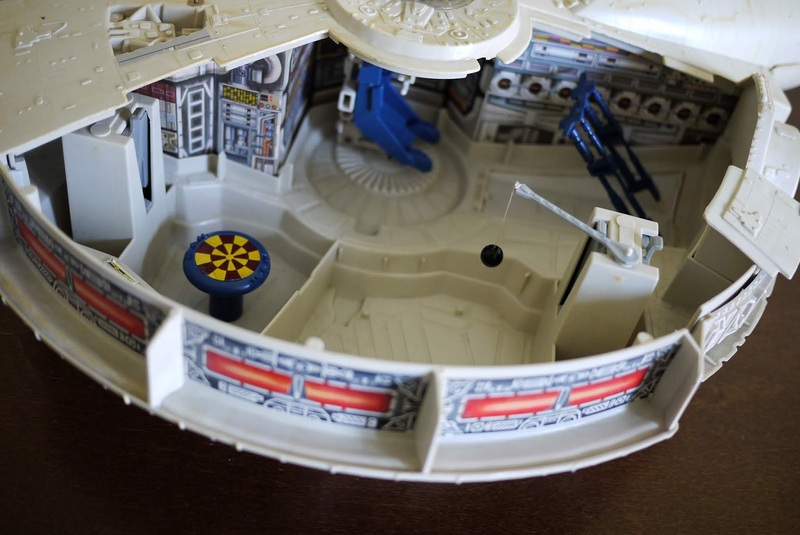 I'm missing the removable flooring. 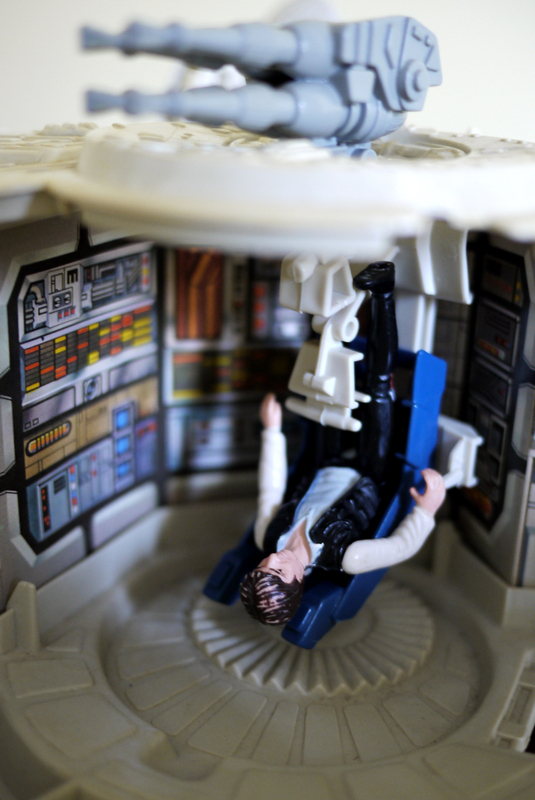 Han in the turret seat. For the Exogorth scene I used two maroon colored sleeping bags to create the "cave," a small flashlight to project light down the open ramp, and another light toward the back to try and give the appearance of exterior ship lighting. That rear light caused a reflection on Chewbacca that looked strange so I used Photoshop to swap in a different photo of the Chewbacca action figure. Unfortunately, I had to use Photoshop again to add the fog that was in the movie, though it doesn't really look too good. I did try to create fog using hot water and ice cubes but I failed to get anything useful from that. My attempt to recreate the Empire Strikes Back asteroid "cave" scene. A similar setup with no backdrop; this is the Chewie I copied. For the space scene I used a black sheet, two diecast Star Wars toys from Kenner, and Photoshop. In Photoshop I darkened the background and added stars; I wasn't too sure how many stars to add and perhaps I overdid it. I've got a few versions of the photo with slight variances as I added lasers from the Falcon's quad laser cannon to one, and then a second Star Destroyer. The stars aren't exact in the photos either since I erased a few in the later images. I did consider trying to add a planet to make it appear as if the ship was escaping Hoth or Tatooine but I'm not great with lighting in Photoshop and assumed I'd make it worse. The die-cast toys with 6" E.T. ruler for scale. The photos can be fun to stage despite being a fair amount of work. I've got a lot of junk lying around which certainly helps when coming up with ideas. Although I'm not too skilled with Photoshop, just using some basic features can be enough to enhance a photo and create something entertaining. Thanks for reading and I hope you enjoy the Solo film. I have not seen the movie yet so I can't add my opinion about that but I sure hope it's fun as many reviews indicate. Funspot: The Largest Arcade in the World!